December 1969. The very threshold of the ‘70s. A time of chaos, change, and optimism. Chaos. Well, yes, of course. It was still the ‘60s. The decade when magic bottles opened and genies flew out, eyes afire with mirthful mischief, fresh with the contagious excitement of liberation. It was a decade of delight in exploring improvisations. To be sure, there were “places” we’d return to, especially in “Dark Star,” but things would also arise spontaneously. And there were the pauses. You can almost hear us listening, searching for a clue as to where the musical flow was headed. We were tending a magic fire with a combination of joy and reverence. And we were rewarded beyond our imaginings. Alembic, a warehouse adjacent to the old Hamilton Air Force Base, housed not only the band’s office but also a rehearsal studio. We rehearsed a lot back then, instrumentally and otherwise. The drummers would work out breaks and patterns by themselves. Fireworks shows for percussion. Inspired by the achievements of Phil’s friend David Crosby, the band got into pray singing with fresh enthusiasm. And achieved something special themselves. It’s where we worked out new material, like “Mason’s Children,” “High Time,” and “New Speedway Boogie,” Jerry’s response to the Altamonte debacle. We tried out patters that weren’t even pieces yet. I recall one in 10/8 that much later became part of “Playing In The Band.” Next day, Phil brought in a song, chords charted on yellow legal paper, called “Clementine.” We tried it all out. Sometimes new material flew, sometimes it didn’t. And we never knew for sure until we played it onstage. Sometimes not even then. And then there was Pigpen. Ronald Charles McKernan. No doubt about him. When he fronted the band, he transformed it into something between a tent revival and a raucous party. He worked the crowd like a magician, like the embodiment of history that he was. My taking over at the B-3 liberated Pigpen to grab a mike and be a front man. “Lovelight” wasn’t scripted, but it just as well could have been, down to the last “Wait a minute!” Eventually there were so many “Wait a minutes” in a performance, Jerry told him to lighten up. Pigpen could get a bit preachy sometimes, but it was a message we were all down with, and no one told him to lighten up on that. Change. If only because it’s inevitable. This period of the band’s history was marked by moving toward discrete, iconic songs, and away from extended jams. Predictably, the record company had been goading us in that direction all along. It was the way things were done back then: a three-minute 45 RPM hit single. That was the not-so-holy grail, and the pressure to come up with one was enormous. There might be those who would think I was pushing for the jams, but that wasn’t the case. To be sure, the spacier it got, the better I liked it, but the new material was so strong as to be irresistible. The songs we were performing those days were mainly the ones that showed up on Workingman’s Dead, and the momentum was naturally moving in that direction already. Furthermore, Jerry had rediscovered the pedal steel guitar and was plowing other fields, including a project that become the New Riders Of The Purple Sage. There was a cowboy flavor in the air. A near-miss at a film casting even had us riding horses in the hills above Novato. Optimism--because it was clear things were changing in wonderful ways. The year 1970 was just around the corner, Altamonte was behind us. The Haight was going downhill, yes, but by then we’d all moved to Marin. It was a new chapter, and wee were brave and ready for the new world before us. I shared in the optimism. Entering my second year with the band, I felt I was finally beginning to get my bearings. Problems of amplification and hearing myself onstage were sorting themselves out. Pigpen and I had been to the Cline Piano Company in SF and selected a Behr Bros. upright piano, which was delivered to our house that very month. I was really looking forward to the extra time to practice, finally living under the same roof with an instrument. Reconciliations were underway. The extended sequences of “Alligator” > “Caution” and “Dark Star” > “Lovelight” were evolving through the melodic gardens of Workingman’s Dead and American Beauty into the elaborate tapestries of Terrapin Station and Blues For Allah. Here we were, rounding out an amazing decade, in the already historic Fillmore Auditorium. I fondly remember that big old friendly barn. The wooden bannisters, the plush appointments, the posters on the walls. Already the scene of so many memories. And here we were to make some more. In July 2012 it happened again, perhaps the most electrifying return of material yet. These things generally begin with surprisingly little fanfare, and so it was with this return. I received an e-mail one morning form Eric Hutchins stating that a friend of his had a box of reels from 1969-1970. This type of correspondence comes across my desk often enough, and the tapes usually turn out to be copies of copies of copies of material we already have in the vault, or audience recordings. In this case, Hutch sent me a detailed list featuring date, venue, reel number, and any other markings that were present on the tape boxes. Immediately I knew this was a legitimate batch of material that we didn’t have. Eric, his friend Janet Cohen (owner of the tapes), and I quickly concluded that the best place for these old reels was back home with their friends, and a few days later they arrived at Jeffrey Norman’s studio, ready for transfer. While there were no full shows in the material that was presented, what we found was something of even greater importance: reels that filled in the gaps in our collection. In several cases, shows for which we had two or three reels (out of the usual four- or five-reel concert) were now completed, including at least four high-level performances that have long been on our wish list for release, but for which we were missing half, or more, of the show. For the CDs in your hands, we had access to reel 2 of 2/2/70, but not reel 1 or 3, and those were returned to make this a complete (and excellent!) show. For 12/20/69, we’d always had reels 1 and 3. 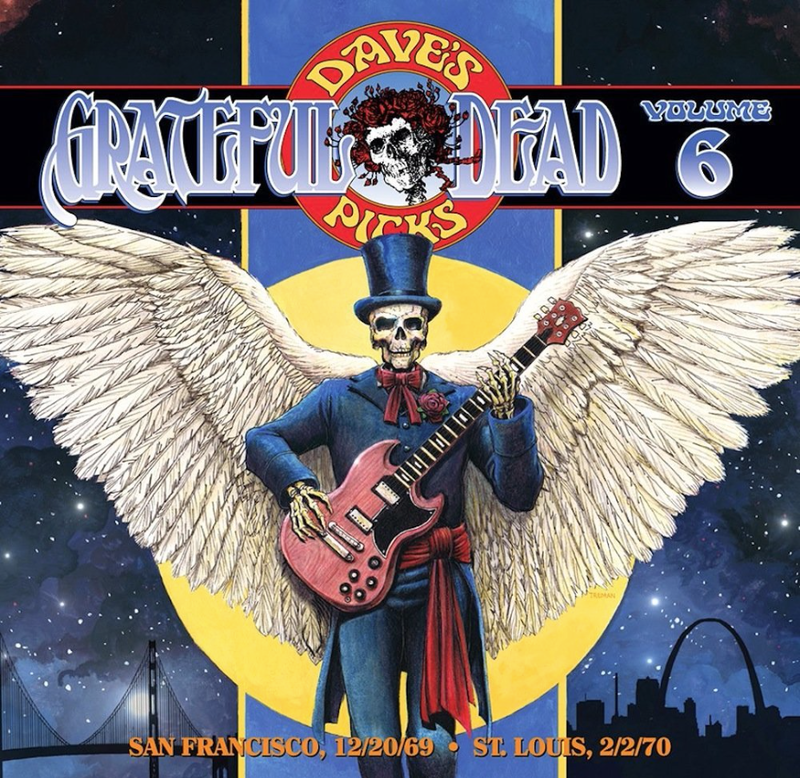 Now, with the addition of reels 2 and 4, we’re able to listen to this majestic “Dark Star,” which no one had likely heard since the night it was performed at the old Fillmore in San Francisco. For a Dead Head and an archivist, it doesn’t get more exciting than this. So I’ve often been asked what the future holds for these returned tapes. There is definitely one and likely two more full-show releases to come from this batch of last 1969/early 1970 recordings, so do stay tuned in 2014 for more music from this stash. One show in particular has a phenomenal “Dark Star,” with some extremely unusual Phil activity. (This show also features many classics from the era that are played exceptionally well: “Morning Dew,” “The Eleven,” “That’s It For The Other One,” amongst loads of other great stuff.) Also, based on the current schedule of major return of tapes to the vault in 1997, 2005, and 2012, hopefully we can expect the next major return in 2019 (or earlier! ), so stay tuned for more great new then. Or course, a huge, heartfelt thanks goes out to Janet and Eric for getting in touch and agreeing that the best home for these reels was back in the Grateful Dead’s collection. And let’s raise a toast to Owsley Stanley, who recorded these reels more than 43 years ago--they still sound great. I wish he was around to hear these tapes and the story behind them. Bear, this one’s for you! Brett Cohen and I met in NYC in 1982, married a few years later, and had two beautiful daughters. For the 20-plus years of our relationship, we had boxes of tapes sitting in the attic, representing the career he pursued before settling into routine domesticity with me raising our daughter. These tapes sat undisturbed all these years--we really didn’t give them a thought. In 2006 we moved from New Jersey to North Carolina, and the boxes of tapes came along, as we were thinking that one day we might open them up and try to play them. But we never did, and Brett and I went our separate ways in 2009. When our eldest daughter entered college in August 2012, I started packing up the house so I could sell it and downsize. While hanging around with friends one afternoon, I randomly mentioned to Eric (a fine musician, by the way) that I had these old tapes, possibly from Brett’s work with the Grateful Dead. Eric’s curiosity led him to investigate what I had stored all these years, and he quickly realized these tapes might just be something of interest to GD history. I am so happy that these tapes have found their way home after all these years. After Janet and I had spoken that afternoon, she asked if I wanted to come by her house and take a look at what she had. Knowing Janet’s connection with the band, I had a good suspicion that these tapes could contain some of their material. The next morning I arrived at her house, and as she dug around in the garage, she pulled out a box and a trash bag containing about 50 old reel-to-reel tapes. As we were going through them, I noticed a significant amount of them were labeled “GD” with dates and venues of shows, songs, and reel numbers. I mentioned to Janet that I believed there might be something here. Originally I thought that maybe these could have been copies of shows, so when I got the reels to my house I took to the Internet to investigate further. I began to look up some of the specific shows from the reels and quickly began to realize that most of these shows were listed as “incomplete” or “unknown.” It soon because apparent that these reels completed shows that the vault had been missing rand, more specifically, contained missing set lists that were previously unknown. After discussing the findings with Janet and some friends, it was determined that I should get in touch with David Lemieux. I contacted Dave via e-mail, mentioning the whole story about Janet’s connection with the band and that she had a box of reels containing material that might be missing from the vault. Dave immediately responded that asked if I could compile a list of the reels and send it to him. The three of us followed up with a phone conversation about them, and by the enthusiasm in Dave’s voice, it was confirmed that these were authentic Bear recordings that had been missing from the vault’s collection for over 40 years. Once I received packing and shipping instructions from Dave, the tapes were off to their new home. This album was released in May 2013.